This post first appeared two years ago as “My Ten Favourite Christmas Songs”. It had a mixed reception, some accounting it a “great list” whilst others, as is their right, rubbishing certain selections and offering their own alternatives. there’s the thankless challenge of breaking down an initial list approaching fifty into ten. That said, after much soul searching, I’d like to think that the ten I have chosen – at least for today would be broadly similar to those I would have plumped for last year and will do next year, and in the years to come. The order may differ slightly but the contenders will remain the same. I make that assertion in the full expectation that the future is unlikely to unearth some sensational new numbers that will threaten the current status quo (those old rockers are not in it by the way. That statement still rings true, and I have re-released that same list today, with only minor textual amendments. One type of “music” you will not find in this list are the aggravating seventies pop confections of Slade, Wizzard, Mud, Shakin’ Stevens and many others that are heard everywhere at this time of year – TV programmes, shopping malls, parties. So if they’re your favourites, I’d stop reading now. And don’t expect to see any of the annual serving of mush served up by Cliff Richard either. I am also unmoved by those songs that may or may not have a Christmas theme and content, but are forever associated with the holiday period purely because that is the time of year when they first came to our attention, often for commercial reasons. This is why I don’t share the almost universal idolatry of “Fairytale of New York”, despite the fact that I love both Shane MacGowan and Kirsty MacColl. I don’t dislike Band Aid’s “Do They Know It’s Christmas” and you cannot knock the tremendous work it has done in addressing famine in Africa. But these are false friends and do not, for me, carry that indefinable spirit and “feel” of Christmas. Bob Dylan doing a Christmas song? You must be mad, or you’ve clearly had too much egg nog – or both, I hear you scream in disbelief. Well, maybe, but he produced a whole album of them back in 2009. And some of it is rather good. The grizzled near seventy year old voice, ravaged by red wine, cigarettes and constant touring, lends itself rather nicely to some of the old standards like “Do You Hear What I Hear? Winter Wonderland” and “Have Yourself a Merry Little Christmas”, though perhaps less so to the assortment of Christmas carols he tackles. Initially, this slot was filled by “In the Bleak Midwinter”, a lovely carol but perhaps just a little too familiar for inclusion here. I was then reminded, on hearing it for the first time this year, of this beautiful and too little heard melody. But, in truth, it could have been any number of other carols. The first of two – there could again have been more – offerings from the Barnsley Belle. It may only be number seven – at least for today – but it tends to be the first song I listen to each December to kick start the festive season with its atmosphere of celebration and community. A song ripe too for inclusion in an adaptation of any Thomas Hardy novel. “The Voice” has to have a place on this list. Warm, vibrant, nostalgic – everything that makes Christmas special. Along with Al Jolson, the Andrews Sisters and Tennessee Ernie Ford, Ella dominated the soundtrack to my earliest years. She has subsequently survived Elvis, the Beatles, Dylan, psychedelia and country rock to maintain a similarly central place in my affections. The more discerning reader might have observed that my carol selections are not the most frequently heard, hence popular. I have not developed the measure of contempt that the more familiar carols might be thought to have bred – far from it, but “See Amid the Winter’s Snow” and the achingly beautiful melodies of my other selections carry the day for me. A passing nod too to the two carols that I most associate with my childhood – “Rocking” and “Away in a Manger” which we “sang”, sat cross-legged on the frozen wooden floor of Glencoe Road Primary School when, apparently, we’d never had it so good (well, for a six year old, perhaps we hadn’t). “See Amid the Winters Snow” has added resonance too in that this was my father and his eldest brothers’ party piece at the end of the annual freemasonry lodge Christmas dinner and dance. They would – so I’m told, I never witnessed the spectacle myself – bring the house down with their heartfelt, drunken duet. This should have been “The First Tree in the Greenwood” but I could not find a video of Kate’s performance. Instead, I returned to the song of which it and many others are variants. Again, I could have filled this list with Kate’s lovely renditions of traditional carols, supported by the mellow tones of the Grimethorpe Colliery Brass Band. But surely, you say, isn’t this one of those “false friends” you sneered about earlier in this article? After all, wasn’t “Messiah” first performed in the Great Music Hall, Fishamble Street, Dublin on 13th April 1742. It’s a Easter, not Christmas song goddamit! By the end of this journey through the last four centuries of western music you may be wondering if I have “got religion”, and specifically Christianity, so drenched in the christian tradition are my selections. It is an understandable question, to which I can only respond that, though the inherited faith, if not the latent spirituality, be long gone, the thrill of listening, and indeed reading, how gloriously others have expressed that faith, endures. And, of course, they evoke that most precious period of our lives – childhood. Fast forward to 2am on Christmas morning. A short, portly figure creeps into the child’s room, cursing through Watney Red Barrel breath that he really should have delivered on his year old promise to oil the door hinges. He places the bulging paper sack at the end of the bed, applauding himself for fooling his son once for what might just be the last time, that he is a certain someone else. Seven hours later, his excitement at receiving the microscope and Beano Annual spent, the child bounds into four inches of new-fallen snow in the back yard. Turning swiftly at the fake Santa’s voice, he is hit full square between the eyes with a gently rolled but deadly fastball. Tears follow as readily as the squeals of delight that had greeted the contents of the sack. But there is neither time for crying nor testing the capacity of the new chemistry set to blow up the house. The traditional whistle stop tour around the houses of friends and neighbours beckons. The breathalyser, legal drink drive limit and compulsory seat belt legislation have all yet to be introduced, and few drivers think of the potentially dire consequences of having a “drink for Christmas” at every one. It is fortunate, therefore, that Mrs Santa takes the wheel. And then the main event. Three tables of varying design, height, width and degree of wobbliness are wedged together, and an equally motley assortment of chairs are looted from every available room to complete the scene. Fifteen places are set for a party that spans three generations. The grandfather, prior to the ceremonial carving of the turkey, leads the toast to his wife and their four daughters-in-law for the preparation of the feast. Secretly, he prays that there will be enough of the bird leftover to lie with his beloved piccalilli in the sandwiches he will take to work at the Royal Navy dockyard. Even the normally taciturn budgerigar averts its permanent gaze through net curtains onto the street outside to join in the festivities by trilling along to Ella, Dean and Bing on the radio in the opposite corner. As the remnants of the Christmas and mincemeat puddings are laid away, the cooks, their work done, turn their attention to Billy Smart’s Circus on the small black and white television. 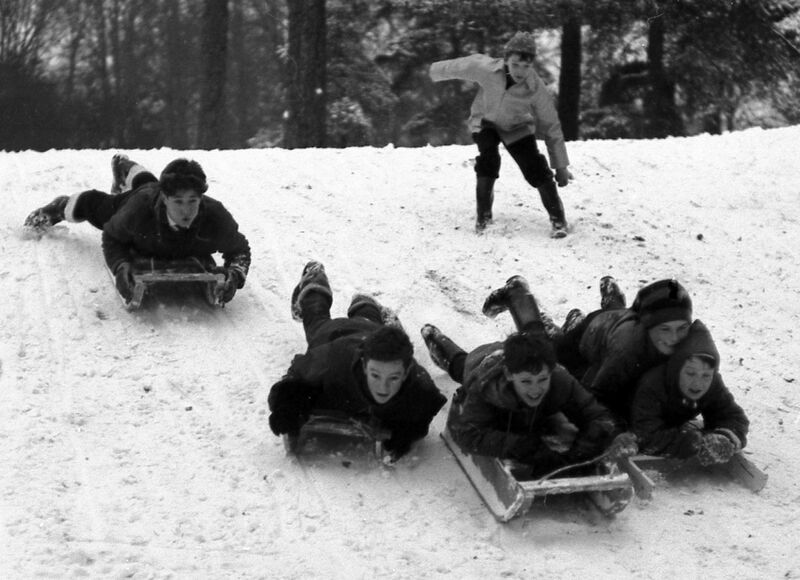 The men are consigned to the kitchen to discharge their traditional washing up duties and the children squabble over who gets the next ride on the new sledge in the snowy back yard. Postprandial slumbers are the order of the next two hours before, prompted by the junior members of the party, it is time for “tree presents”. Television plays only a peripheral role in Christmases of this era, losing out by mid evening to a family singalong. The favourite uncle, worse for wear from a cocktail of cheap fizz, Party Seven beer and Bols advocaat, leads the traditional rendition of the Music Man who “comes from down your way”. The children wrestle their weariness as they “pi-a-pi-a-pi-a-no” and “umpa-umpa-umpapa” to their heart’s content, their giggling intensified by the bandleader flicking his loose front tooth up and down with his tongue as they sing. Boxing Day is barely two hours old when the ladies ascend the stairs to sleep, but only after they have, after customary mock protests, prepared Irish coffees for their increasingly inebriated husbands. Their departure lends licence to the grandfathers, fathers, uncles, brothers, sons, male cousins and grandsons to fight for every available inch of floor space in the lounge. A ritual as old as the monarch’s Christmas message or brussel sprouts is about to be played out – the annual “world farting contest”, the title of champion having been proudly borne for nearly a decade by the child’s youngest and supremely flatulent uncle. But as the boy drifts into a long overdue sleep, his only thoughts are of the seasonal event that is second only to opening of that sack nearly twenty four hours earlier – the Boxing Day football match.